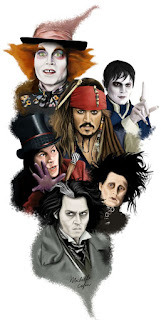 Now most people know that Johnny Depp is a strange yet good looking actor who plays characters like Captain Jack Sparrow, seen in the 'Pirates of the Caribbean' series of movies. But of course, he's also much more than just that, isn't he? He's a lover. He's a fighter. He's a musician. He's a pale-faced goth-punk. And now, thanks to those loverble clowns over at Morph Suits, he's an amazing infographic too. Here, check this out. 1) Alive With A Dead Painter: John Christopher Depp was born in Owensboro, Kentucky, on the same day Jacques Villon: the French Cubist painter, tragically passed away. It was on the 9th of June, 1963. 2) Rock On: Johnny's passion for music began when his mother gave him a guitar on his 12th birthday. So much so, that prior to him becoming an actor he had a dream of becoming a rock star and played in numerous garage bands. 3) Man On The Move: During his childhood Johnny and his family lived in more than 20 different states before settling in Miramar, Florida. According to the man himself, he put this down to his fathers work as a civil engineer. 4) For The Love Of Nick: In an interview he gave to the press, Johnny praised Nicolas Cage for his start in acting, saying that if it wasn't for Nick getting him his first acting agent, his career in film would never have kicked off. Years later he thanked him once again by paying off Cages' financial debts. 5) Spit At The Screen: Johnny's first film work was to play a hapless victim in Wes Cravens 1984 horror classic, 'A Nightmare on Elm Street'. He basically got sucked down and spat out of a bed by Freddy Krueger. 6) Tattooed Tears: While he was dating his 'Edward Scissorhand' co-star, Winona Ryder, Johnny had the words "Winona Forever" tattooed on his shoulder. Yet sometime later, following their breakup, Depp altered the ink to read "Wino Forever". 7) The Armadillo Did It: Johnny famously blamed an armadillo for trashing his hotel room whilst staying at the Mark Hotel in New York. But as we all know it wasn't an armadillo who did this. It was Johnny himself, blaming it on his aforementioned break-up with Winona. 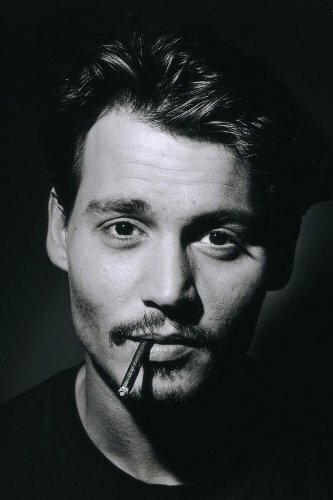 8) For The Love Of Johnny: So far Johnny has been married twice in his life. From 1983 to 1985 he married the make-up artist, Lori Anne Allison. Where as from 2015 to the present date he's married to the model, Amber Heard. No. Don't worry. I haven't forgotten about his association with the singer, Vanessa Paradis. Although in this instance Johnny never married Vanessa despite having two children and becoming partners from 1998 to 2012. 9) Ripping Son: Johnny named his son Jack after the Victorian serial killer, Jack the Ripper. The reason he gave for this doesn't have anything to do with him starring in the 2001 Jack the Ripper film, 'From Hell', but rather his bludgeoning fascination on the Rippers crimes. 10) Out With A Bang: Although initially he was just a fan, Johnny-boy-Depp eventually became a long-time friend of gonzo journalist / author, Hunter S Thompson. As a matter a fact, he loved the crack-pot so much, he starred in two film adaptations of Thompson's novels, "Fear and Loathing in Las Vegas" and "The Rum Diary", plus paid for his funeral after he committed suicide.